Relax in the contemporary 2-Bedroom, with private pool and balcony promising absolute privacy and space for guests to unwind. From Tuesday 29 January 2019 until Saturday 29 January 2039: Enjoy 5 % off! 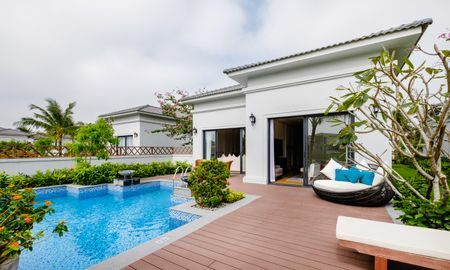 The 3-Bedroom Villa is a beautiful tropical space to truly unwind, allowing guests to relax in the contemporarily furnished living areas while savoring relaxation in the 2 rooms comfortably furnished and providing the guests with all the needed amenities. The accommodations, tastefully furnished, offer comfort and privacy along with private pools and balconies looking out to the resort’s lagoon. Nurture the wonder and excitement at Asia Park and don’t miss out on the Marble Sculptures and the glorious Marble Mountains. Vinpearl Resort & Spa Da Nang is located in proximity of the Marble Mountains and not far from Asia Park Danang. The resort is approximately less than 30 min drive from Da Nang International Airport. Please note that the property only accepts payment in Vietnamese Dong (VND). Kindly present document that proves Child's age upon check-in. Maximum 1 child under 4 years stays free of charge when using existing beds. Older children will be charged separately and guests are to pay the surcharge at the property. If documentation is not provided, age will be converted based on Children's height. Please contact the property directly for further information. 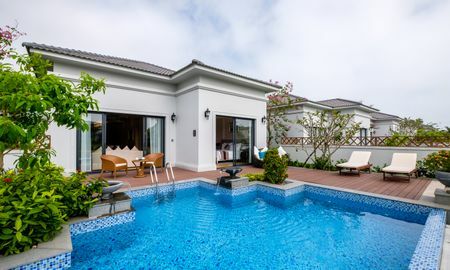 Guests need to contact Vinpearl Resort & Spa Da Nang for the airport transfer fee.